Asthma. Cancer. Heart Disease. All caused by pollution. Vallejo is fighting the proposed cement plant and private port at the Sperry Mill site in a neighborhood already classified as a SB535 Disadvantaged Community. Zip code 94590 has shockingly high rates of air and ground water pollution. Let’s revitalize our Vallejo with real, healthy job growth that benefits everyone. 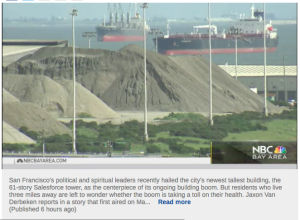 NBC has an in-depth look at how the Hunter’s Bayview neighborhood is under a pollution attack.